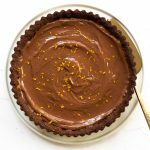 This Chocolate Orange Tart Recipe is a fabulous Vegan Dessert that uses tofu to make the creamy filling. The pastry is also gluten-free, making it suitable for everyone! I made a dessert! And not just any dessert! A vegan dessert that is also gluten-free! 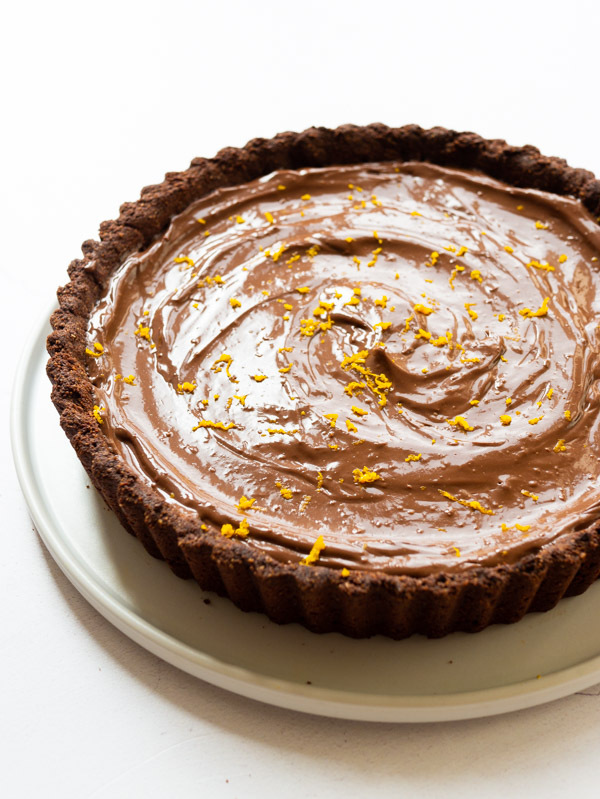 This chocolate orange tart has a wonderfully crisp chocolate pastry with a creamy chocolatey, orange filling that is just delicious. If I do say so myself. The thing is, I’m really good at eating desserts. Like, REALLY good. Really. But I don’t often make them. I’m much more of a savoury gal when it comes to cooking. So when I do it is often for a special gathering and it is always someone else’s recipe. I used ground almonds and cacao powder for the base of it. The cacao powder itself is quite bitter so there’s also a little bit of sugar in there to balance it out. Then to bind it all together I use coconut oil; because it solidifies when cold it’s ideal for making pastry. Due to the pastry being gluten free it is a lot more fragile and crumbly than your average pastry. You haven’t got those stretchy gluten strands sticking everything together. That being said, I think I’ve done a pretty good job here. Just be patient and gentle with it and all will be well! Yep I said tofu. Who knew that tofu could be so incredibly delicious. 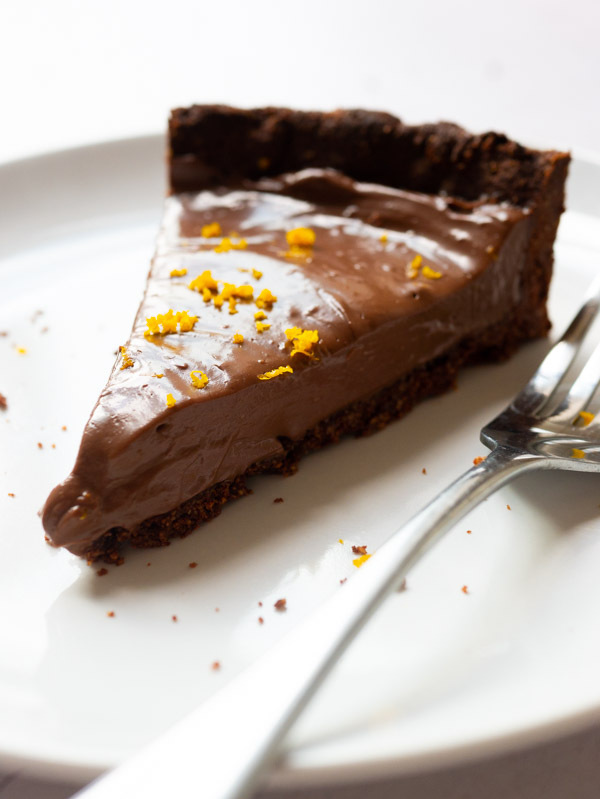 The filling is a blended mixture of silken tofu, vegan chocolate, cacao powder, orange zest, orange juice and maple syrup. Whiz it all together as you can see above and you’re in for a TREAT. If the pastry seems like a bit too much of a faff I would highly recommend you make the filling. It has a wonderfully thick, mousse-like texture that is rich and chocolaty. You wouldn’t even think it was dairy-free, never mind that it’s made of tofu! Transfer the tart onto a plate and cover with cling film, or to an air-tight Tupperware container. Pop it in the fridge and consume within 3-4 days. 🍊 Nothing! It tastes fabulous just as it is. 🍓 Fruit such as raspberries or strawberries. 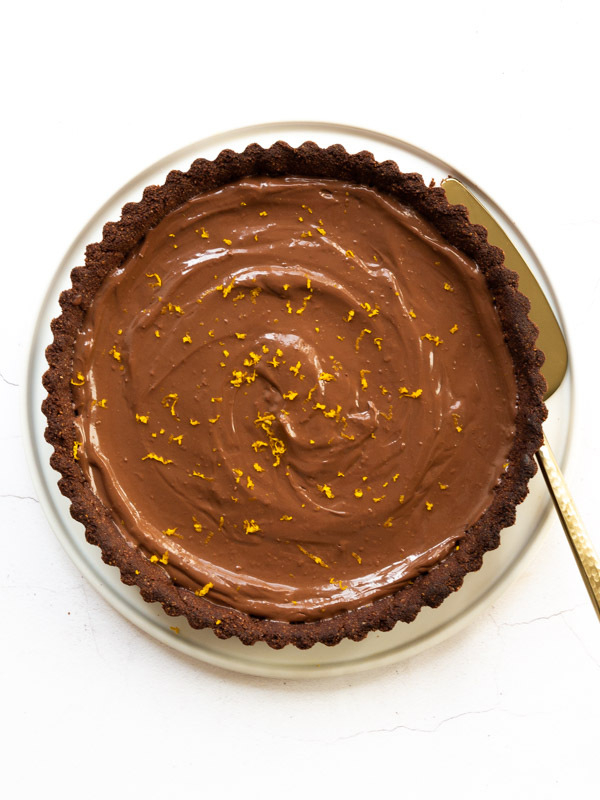 Not only is this Chocolate Orange Tart vegan, but it is also gluten-free! A wonderfully chocolatey, crisp pastry case with rich, creamy chocolate filling. So good! In a food processor (I use my Bosch Food Processor) add the ground almonds, cacao powder, sugar and salt and pulse briefly to combine. Add the coconut oil and process until fully combined. Add two tablespoons of water and pulse to combine. Squeeze a small amount of the mixture in between your fingers, it should stick together and feel moist. If the mixture feels dry or is very crumbly add another tablespoon of water. Use a pastry brush to grease a 30cm (12″) loose base flan tin using a little bit of oil or coconut oil. Tip the pastry mixture out onto a clean surface and bring it together with your hands, ensuring that everything is fully mixed. Take two-thirds of the mixture and, using your hands, press it into the base of the pastry case until you have a smooth, even layer. Press the remaining mixture into the sides and crease of the flan tin. The pastry should be between 0.5-1cm. Pop it into the fridge to chill for 20 minutes. Pre-heat your oven to 160ºc. Prick the base of the pastry case with a fork then bake in the oven for 30 minutes. Leave the pastry in the tart case until it is completely cool. While the pastry is cooling make the filling. Remove the tofu from its packaging and wrap it in several layers of kitchen roll or a clean tea towel for 5-10 minutes to remove excess moisture. 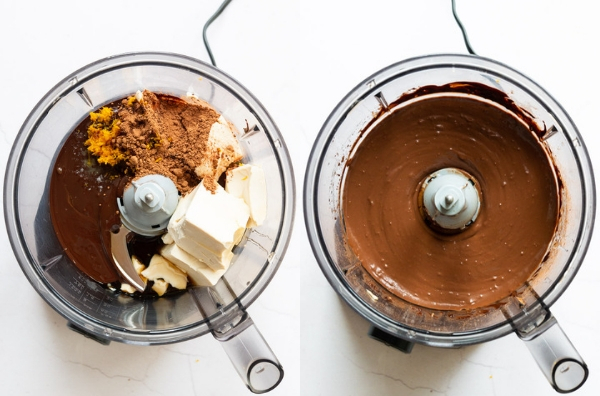 Add the tofu, melted chocolate, maple syrup, cacao, orange zest and juice, vanilla and salt to a food processor and mix on high speed until the mixture has combined and is smooth. Remove the cooled pastry case from the tart tin as carefully as possible. Spoon the filling into the pastry case and smooth over. Finish with a sprinkle of sea salt or orange zest. Serve and enjoy! 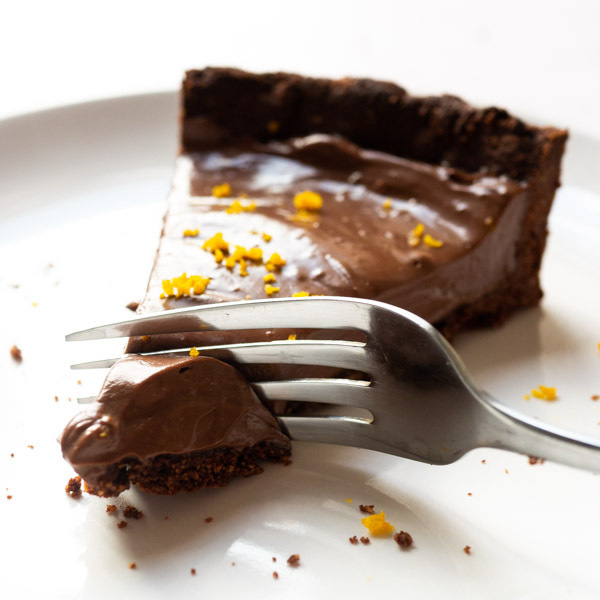 I have used cacao powder in this recipe but you could also use cocoa powder. When making the pastry I have tried the traditional method of wrapping in cling film, chilling and rolling out before getting it into the tin but the pastry is too delicate and falls apart. Pressing it directly into the tin saves a lot of time and effort for very similar results! Update Information: New FAQ added.